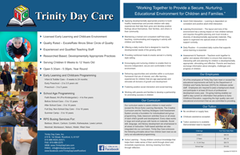 Trinity Day Care provides a nurturing environment where children thrive! We are a not for profit organization, licensed through the Illinois Department of Children and Family Services and recognized by the Quality Rating and Improvement System (QRIS) National Learning Network. Our programs and facilities offer a developmentally appropriate, stimulating and active learning environment for young children, awarded a Silver Circle of Quality by QRIS. We love to see children thrive as we support them in the way they learn through play! What joy there is to be found in learning!